Walmart.ca Grocery Pick-Up is Fun & Easy! Walmart.ca grocery pick up from Penguin Pickup at UPS Yorkville. During the Holiday Season you can get bogged down with gift buying and numerous errands taking up most of your time before the year ends... Travelling in busy crowds & unpredictable Toronto weather can cause major havoc on any given day. I really try my best to avoid the crowds especially during the holiday season. Long lines and I don't mix. Thankfully walmart.ca has a new Grocery PickUp service at walmart.ca that makes everything so convenient and easy! CLICK, CLICK, CLICK & Collect. I went on to walmart.ca website & clicked on Grocery PickUp button to begin shopping for fresh groceries & pick up at a Penguin Pick-Up or Walmart location of my choice. I basically clicked on all the products I needed in an easy & categorized navigation page. Walmart will also AdMatch prices advertised by any competitor so you're guaranteed the lowest price. Here is an example of the various categories to grocery shop. You can select from all the same products available in store at a Walmart location. 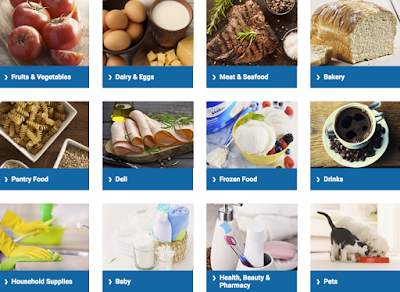 From canned goods to fresh produce, you can even order your pet food too! A $3 service fee will be applied and orders are to be a minimum of $50. Walmart.ca currently has condo delivery locations as well. Imagine shopping for groceries & having them deliver to your condo. They have this service now for 3 locations in the Toronto area. *additional $10 applies for this service. Refridgerator for delivery of walmart.ca orders. Overall, my experience using the walmart.ca Grocery PickUp was quick and hassle free. I placed an order on a Tuesday afternoon & scheduled my pick-up the next day at a UPS/Penguin location with no product quality issues. My vegetable and meat orders were properly refrigerated upon pick up as shown above. This experience saved me on gas expenses as I was able to select a location close to home for pick-up. I had no line-ups & experienced a one on one customer experience at my UPS location. This was such a time saver for me. Overall, I'm going to use this Walmart Grocery Pick-Up service again! UPS Store - Penguin Pick Up location in Yorkville. This post is sponsored by Walmart Canada as part of the Walmart Grocery Pick-Up program. In exchange for this post, I have received perks in the form of products and/or compensation. All opinions on this blog are my own.